PM responds to Olmert: "When I see that interests vital to the security of Israel's citizens are in danger, I will not be silent." Prime Minister Binyamin Netanyahu clarified on Sunday evening that he has no intention of stopping his warnings against a nuclear Iran. Netanyahu’s comments came shortly after he was criticized by his predecessor, Ehud Olmert, who accused Netanyahu of “declaring war” on the United States administration. 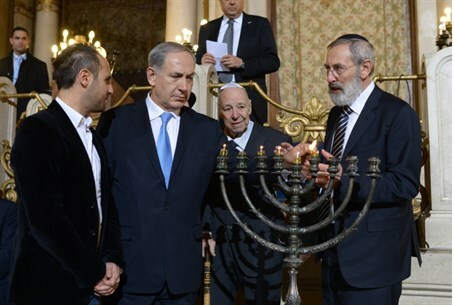 "In contrast to others, when I see that interests vital to the security of Israel's citizens are in danger, I will not be silent,” declared Netanyahu during a Hanukkah candle-lighting at the Great Synagogue in Rome. “It is very easy to be silent. It is very easy to receive a pat on the shoulder from the international community, to bow one's head, but I am committed to the security of my people. I am committed to the future of my state and in contrast to periods in the past, we have a loud and clear voice among the nations and we will sound it in time in order to warn of the danger,” he added. “And as to the actual threat, we will act against it in time if need be. I would like to dispel any illusions. Iran aspires to attain an atomic bomb. It would thus threaten not only Israel but also Italy, Europe and the entire world. There should be no going astray after the attack of smiles. “Today there is a regime in Iran that supports terrorism, facilitates the massacre of civilians in Syria and unceasingly arms its proxies – Hamas, Hezbollah and Islamic Jihad – with deadly missiles. “The most dangerous regime in the world must not be allowed to have the most dangerous weapon in the world. As we have warned, and I say this with regret, the sanctions regime has started to weaken and very quickly. If tangible steps are not taken soon, it is liable to collapse and the efforts of years will vanish without anything in exchange. But at the same time, I tell you and promise in the spirit of the Maccabees, we will not allow Iran to receive a military nuclear capability," said Netanyahu. Speaking earlier in the day at the Institute for National Security Studies, Olmert attacked Netanyahu for the way he has handled his disagreement with the U.S. over how to deal with Iran’s nuclear program. Netanyahu has repeatedly warned that the deal struck between the West and Iran last week is a dangerous one that would allow Iran to continue to develop its nuclear program while receiving relief from sanctions. This position has put him at odds with Obama, who reportedly asked Netanyahu to “take a breather” from his criticism of the deal.